As passionate glass artists working in Pittsburgh, Ron and Kathleen envisioned a place that would attract top artists but also welcome the novice artist and non-artists intrigued by glass. Pittsburgh Glass Center Opened in 2001. They worked for 12 years to bring the people together who would help make their dream a reality, including artists, foundations, community members, and glass enthusiasts like the Block family. William and Maxine Block were avid glass collectors who supported Kathleen and Ron’s vision. Their daughter Karen Block Johnese was very involved. She secured the organization’s nonprofit status in 1998, recruited the first board of directors, and helped raise over three million dollars to build the world-class facility. With the help and support of the Urban Redevelopment Authority, Friendship Development Associates, and Bloomfield-Garfield Corporation, their vision was realized in 2001 when the Pittsburgh Glass Center opened its doors to the public. Since then, PGC has educated more than a quarter of a million individuals, contributed to the ongoing development of the city’s East End, and made Pittsburgh a significant hub in the international studio glass community. Long before it became known as the Steel City, Pittsburgh was actually known as “America’s Glass City,” with the region’s first two glass factories opening in 1797. The city’s strategic location on an inland river system, with its easy access to raw materials, furnace coal, and trade routes, made it an ideal manufacturing site. After the Civil War, Pittsburgh’s glass production boomed, and the city could begin to boast that its products had been on the tables of five U.S. presidents and in embassies worldwide. Yet Pittsburgh didn’t just make tableware and window glass. Pittsburgh-manufactured glass could be found in the tiles of New York City’s Holland and Lincoln Tunnels, in the glass insulators studding electrical lines, in traffic and railroad signals, in searchlights along the Panama Canal, and in the headlamps of the new Ford automobile. By 1902, there were over 150 glass factories in western Pennsylvania, eastern Ohio, and the northern panhandle of West Virginia. The discovery of natural gas further ignited the region’s economic and industrial development, and by 1920, this area produced 80% of the nation’s glass. 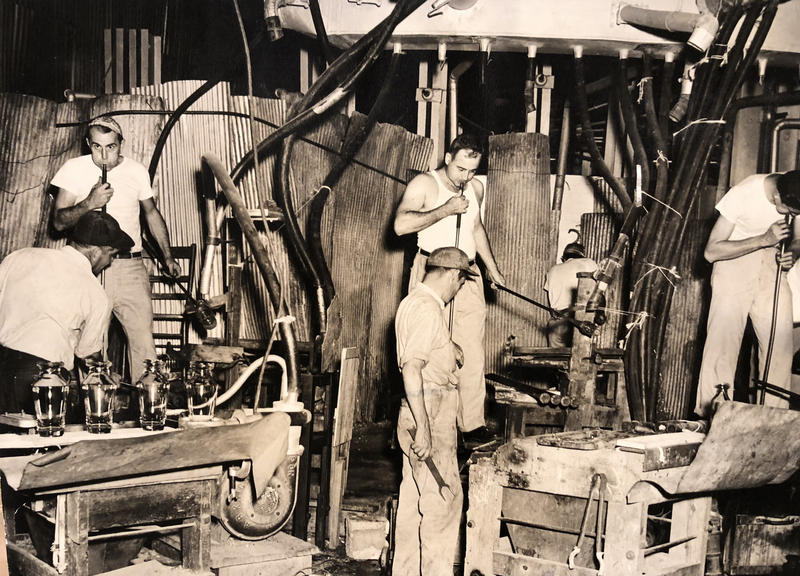 However, the local glass industry soon faced a series of significant challenges, including Prohibition, the Great Depression, competition from national and international producers, and the advent of alternative materials, such as paper cups, plastic, and aluminum. Glass plants in western Pennsylvania began to close in the late 1960s. Still thriving in the region today are a few utilitarian glass companies, such as Kopp Glass, which currently serves a high-tech niche market, and Jeannette Specialty Glass, which manufactures commercial, industrial, and residential glass products. Today, traditional glassmaking techniques are enjoying a resurgence in Pittsburgh, where art is transcending industry. New artist-run glass studios and glass-focused businesses are popping up all over the Greater Pittsburgh region, including new workshops and storefronts in Braddock and Millvale and the Pittsburgh neighborhoods of Larimer, Lawrenceville, South Side, and West End. Many of these artists developed and honed their skills at PGC and continue to contribute to its culture. An incubator for artistic innovation and individual creative development, PGC is truly contributing to the region’s economic and cultural advancement. PGC is ultimately building on Pittsburgh’s legendary glassmaking heritage by emerging as one of the nation’s top contemporary art glass facilities. 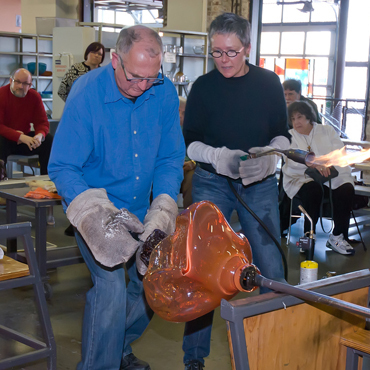 Our live demonstrations, classes, gallery exhibitions, studio rental opportunities, and state-of-the-art workspaces draw visitors, students, and professional glass artists from around the world.